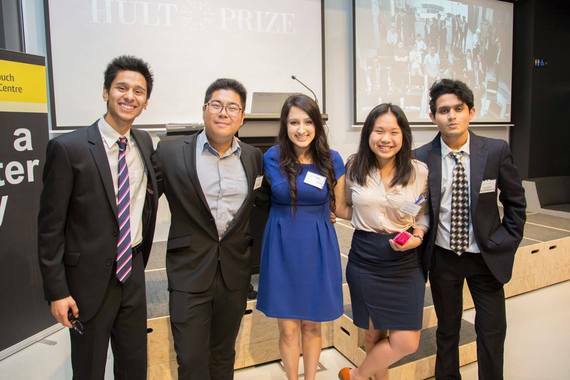 As the first Campus Director for the Hult Prize@ University of New South Wales, I had one simple goal: to make everyone on campus well aware of the Hult Prize, the world's largest student competition for the creation of new social enterprises. In Australia, UNSW is the hub of student innovation, and has seen many successful entrepreneurs come through our campus, including Hassan Ahmad, co-founder of Conscious Step and Hult Prize alum. I learned a lot over these past few months, as both an entrepreneur and leader. 1. Be prepared to repeat the same things over and over again. When talking about social enterprise and entrepreneurial ideas, you must be able to succinctly and clearly describe what that means. Mentors always talk about focusing on "your pitch". After countless emails and phone calls, sharpening my Hult Prize pitch was exactly what I needed to focus on. Selling something that, in Australia, hardly anyone knew about was going to be a difficult feat. Getting frustrated when they responded, "What is it the Prize?" was not going to help me. You may have to pitch one time, ten times, or one hundred times, but it is your level of authority and enthusiasm on the subject that is really going to sell it. When I first started, I struggled with writing sponsorship emails that were too long. I wanted to describe everything in detail, but I learned that being clear and constructing concise sentences are more effective. It was not easy at first, because I didn't know what really were the key selling points of this competition. That is why it's important to keep practicing and refining your pitch, and it's well worth it in the end. Bringing media outlets, prominent judges and speakers on board helped boost credibility for our event. 2. Recruit people who are really good at what they do. I am not an expert when it comes to publishing press releases, creating social media graphics, contacting sponsors, or arranging catering. When it comes to recruitment, find people who can do specific things in which you are not an expert. As a leader, you have to ensure that your team knows the mission, and work with them to define goals and a strategy. This approach paid off well for us, with a marketing coordinator who ran an aggressive social media campaign and got us traction, a graphic-designer who created our graphics, a sponsorships coordinator who got us access to experts and past case-competitors from UNSW, and an events coordinator who ensured the event ran smoothly. Entrepreneurship is a fast-paced world, and you won't have time to become an expert in everything. It's important to know when to outsource and bring in the skills that you are lacking. I remember going to a workshop run by a motivational speaker who would tell his clients, "What do you want the audience to remember, the tea and coffee, or my presentation?". This was at the back of my mind when planning our events, as our funding was very limited. Do I want the audience to remember the food platter, or the quality of the student presentations? Do we really want to spend our time looking at caterers, when we could invest that time in organising our social innovation workshop for participants and creating new partnerships? The competition became a near obsession to me, because I knew if I wasn't fully invested in its success, it wouldn't be great.I wanted judges and spectators to leave the venue with the understanding that UNSW social entrepreneurs are going to change the world. We focused on getting quality student teams, running workshops for them and assembling judges who are diverse in the field, and mentor these teams. 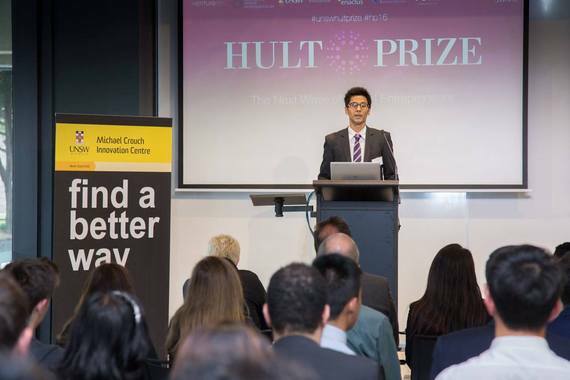 The Hult Prize@ UNSW network has now grown to a community of more than 100 people. 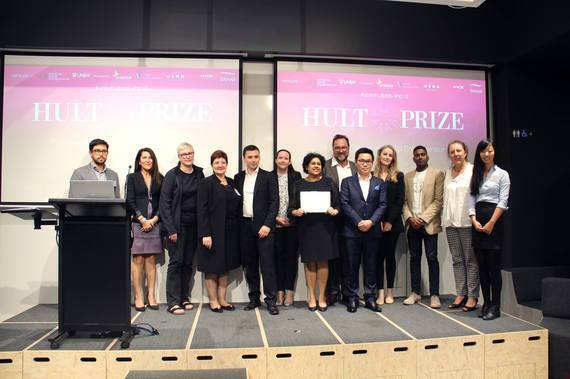 It's great to watch our local champions recruiting the judges to join their advisory boards, and see how they are being invited to speaking events to highlight the social impact of their company, in the long run further spreading the Hult Prize across Australia. If you are a student reading this, and interested in organising the Hult Prize competition at your campus, go for it! The work is tough but the skills and experience it brings will carry you to your future career.